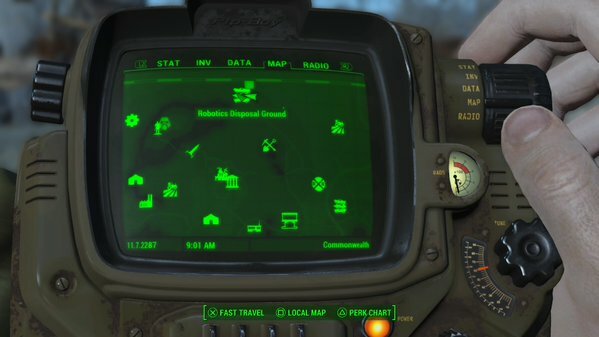 - The Robotics Disposal Ground is located in the wilderness to the northwest of Sanctuary, on the side of the road. You’re most likely to find it while travelling to USAF Satellite Station Olivia for a quest. - The Robotics Disposal Ground is a fairly desolate location. The only items of immediate note from wandering around are a Fusion Cell and a Military-Grade Circuit Board in the trunk near the middle of the Ground; a Fat Man sitting atop several wrecked cars a few hops away from the trunk you just raided; and some Flamer Fuel beside the lamp post. You can also find a Mini Nuke for the Fat Man just outside the Disposal Ground, amid a heap of tires. Look on the other side of the fence from the concrete building. 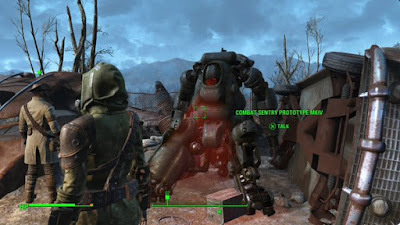 - Oh, and there’s also an enormous robot. Did I mention the robot? No? Cool. - Pop into the small concrete building nearby. There’s a first aid kit by the door with some meds inside, two more Military-Grade Circuit Board on the shelves, some crafting items in a toolbox, and a Hot Rodder magazine beside the room’s terminal. Also, a Weapons Workbench. Deactivate the Combat Sentry. Obvious. Engage Defensive Protocol. Doing this will send the Combat Sentry off to wipe out the enemies in one of four nearby compounds, namely USAF Olivia, South Boston Checkpoint, Revere Satellite Array, and Fort Hagan. Very nice if you’re having trouble with any of those areas, though bear in mind that it can’t go inside if there are interior spots, such as at USAF Olivia. Still, handy - especially since the thing will return to the Disposal Ground between missions. When examining potential points of future change, I prefer robotics, the important component of the other. Robotics is a field which rapidly heading towards a state of all generic platforms.